A lot of parents call our offices with just this question: Should my child take the ACT or the SAT? How do you know which test is right for him or her? What do you recommend? These are all good questions. And, the answer is not the same as it once was. WHAT IS THE ACT? WHAT IS THE SAT? 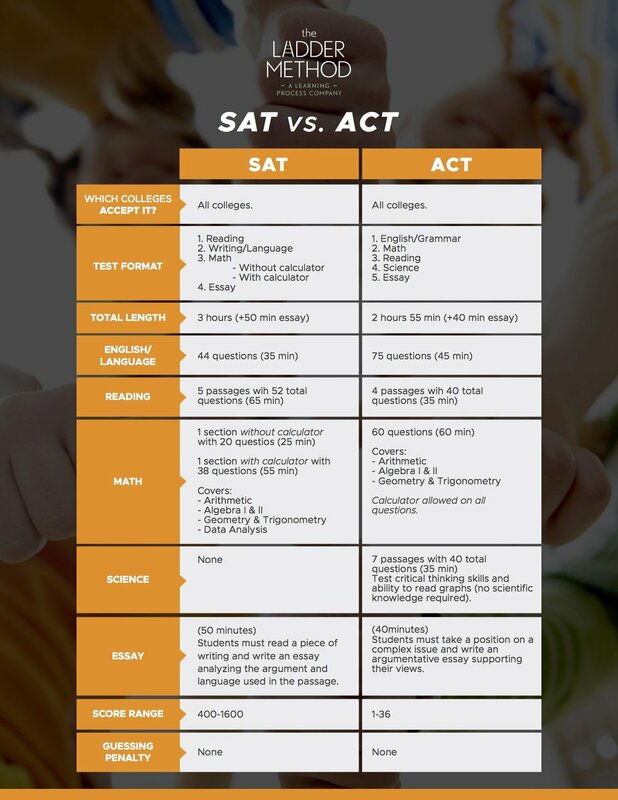 The ACT and the SAT are both standardized tests that the colleges use in evaluating a student during the college application process. HOW DO YOU DECIDE WHICH TO TAKE? We often suggest to parents that they have their student take both diagnostics to determine which test their child fairs better at. The old line of thinking was that: The most simple answer is that students who do well at math might fair better at the SAT because there are two sections of math. While students who are better at reading comprehension perform better on the ACT because there is Grammar, Reading Comprehension and a Science section which also tests comprehension. IS THERE A PREFERRED TEST? Years ago, the colleges preferred the SAT and some colleges did NOT even look at the ACT. But, that has changed. All colleges now accept the ACT as well as the SAT. There is no preferred exam. The ACT & the SAT exams are different so once a student has refreshed on the grammar and the underlying math, the actual test questions on each test are quite different. It requires getting to know the questions on the test.